Salman Khan’s Race 3 may raise the bar of action genre going by a behind-the-scenes video of the Remo D’Souza-directed film. Fan clubs are frantically sharing a snippet from upcoming film Race 3, in which Sikander (Salman’s character) is riding the bike, stopping only to fire bullets at his enemies (not to mention the swag with which he swivels the bike with one hand). 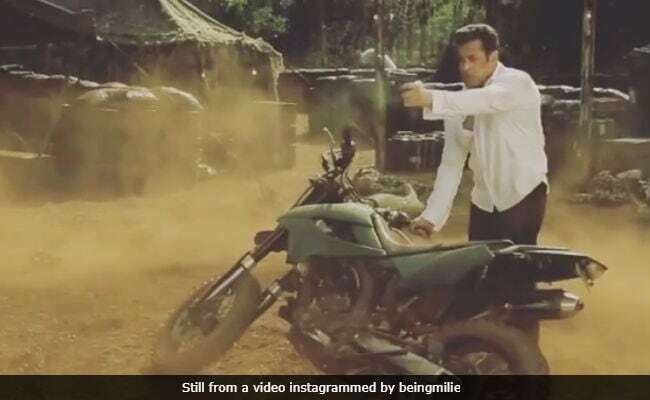 Salman Khan looks lethal in the video as he hunts down his enemies. This is presumably one of the many action sequences in from the thriller. Race 3 is a reboot of the Race series. Salman Khan took over from Saif Ali Khan in the third film – “Who better than Salman Khan for this?” Saif told news agency PTI. Jacqueline Fernandez, who was in part 2 and Anil Kapoor, who starred in both the Race films, are the only two old faces of the team. The revised Race team comprises Bobby Deol (reportedly as the antagonist), Daisy Shah, Saqib Saleem and Freddy Daruwala. Remo D’Souza also replaced Abbas Mastan as the director.